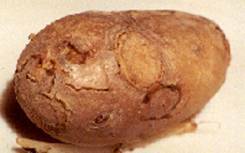 Potatoes can be infected by many different viruses that can reduce yield and tuber quality. Virus diseases can often be diagnosed by mosaic patterns on leaves, stunting of the plant, leaf malformations, and tuber malformations. 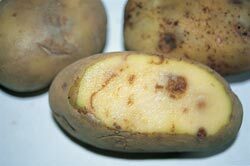 Symptoms are not always expressed due to interactions between the virus and the potato plant, growing conditions such as fertility and the weather, or the age of the plant when it is infected. Serology and nucleic acid detection techniques are often used to diagnose and characterize suspected virus diseases. 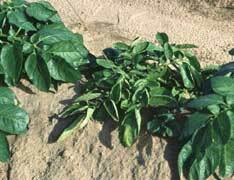 Listed below are several common viral diseases of potatoes in New York , a description of the viruses and vectors, as well as management options. Potato virus Y (PVY) is one of the most prevalent and important viruses in potatoes. Recently, strains of PVY which can cause necrosis (dead spots on leaves and in tubers) have been discovered, creating more concern about this widespread virus. PVY is a Potyvirus, the type member of the largest group of plant viruses. It is transmitted by aphids in a nonpersistent manner, by sticking to aphid mouthparts (stylet). The virus can be acquired from the infected plant within seconds, and transmitted to a healthy plant just as fast. PVY can also be transmitted mechanically by machinery, tools, and damaging plants while walking through the field. Aphids are by far the most efficient means of transmission. 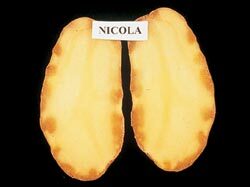 Several strains of PVY have been identified that differ by the symptoms they cause in potatoes and tobacco. PVYO is the common strain, and causes mosaic symptoms. PVYC causes stipple streak. 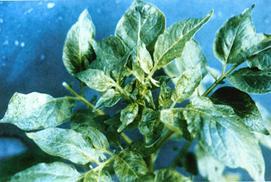 PVYN, the necrotic strain, generally causes mild foliage symptoms, but necrosis in the leaves of susceptible potato varieties. Mixed infections of common strains and the necrotic strain are common, and the genomes (genetic material) can mix, producing hybrid strains (i.e. PVYN:O and PVYNTN). PVYNTN strains can cause tuber necrosis, and are of increasing importance in New York. Diagnosis can be difficult, because there are antibodies to PVYO and PVYN, but immunological methods (ELISA, Enzyme Linked Immunosorbent Assay) cannot distinguish PVYNTN from these two virus strains. Additionally, not all PVYN isolates will react with PVYN - specific' antibodies, and some PVYO isolates will. Symptoms alone cannot distinguish these virus strains, as symptoms vary with age, time of infection, temperature, and the genetics of both the virus and the plant host. 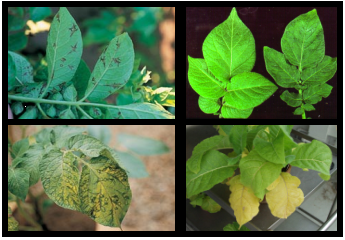 PVY strains can interact with other potato viruses such as Potato virus X (PVX) and Potato virus A (PVA) to result in heavier losses. Necrotic symptoms in tubers often increase after storage.Some varieties such as Russet Norkota and Shepody rarely show symptoms, but can carry the virus and serve as reservoirs for aphid transmission. 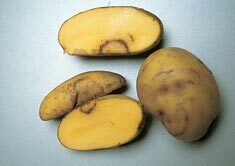 Yukon Gold is particularly susceptible to tuber necrosis. Necrotic symptoms on leaves of potato and tobacco (lower R) caused by PVYN. Since PVY is a nonpersistent virus and is transmitted quickly by aphids, the use of insecticides to control spread is generally not effective. 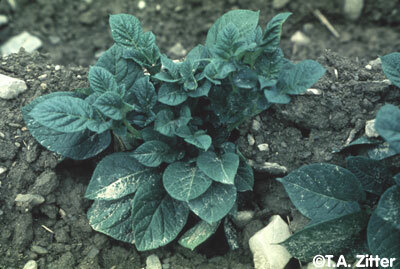 The best strategy to control PVY is to use seed potatoes certified to have low virus content. Mineral oils can be used to reduce spread by aphids, but must be re-applied at frequent intervals to be effective. Minimize mechanical spread by sanitizing equipment and reducing traffic through the field. Infected plants can serve as a source of inoculum for the rest of the field, so rogue (pull out and dispose of) symptomatic plants. Solanaceous plants such as tomatoes, peppers, nightshade and ground cherry can harbor the virus and serve as a source of inoculum. Avoid planting potatoes next to weedy ditches and hedgerows, and practice good weed control within the field. Varieties with some resistance or tolerance to PVY are Eva, Dark Red Norland, Belrus, HiLite Russet, Kennebec, Monona, Norwis, and Sebago (source: http://muextension.missouri.edu/xplor/agguides/hort/g06202.htm). 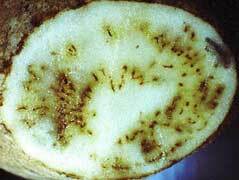 Potato leafroll virus (PLRV) is a phloem-limited Luteovirus which is transmitted by aphids in a persistent manner. In contrast to PVY and AMV, PLRV takes longer to be acquired (10-30 minutes) and transmitted (24 to 48 hours) by aphids, since the virus needs to move into the gut, through the body and back out through the salivary system of the aphid. 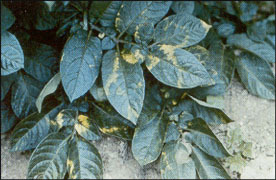 Symptoms of PLRV include a characteristic upright character and rolling of the leaves, chlorosis (yellowing) or reddening, leaves with a leathery feel, phloem necrosis (dead spots along the leaf veins), stunting (reduced height) of the plant, and net necrosis in tubers. The severity of net necrosis will vary depending on when the plant was infected, and may increase during storage. Some varieties are more susceptible than others, including Russet Burbank, one of the most commonly grown commercial potato varieties in the western US. Symptoms of PLRV on foliage (rolling of leaves, stunting of plants) and tubers (net necrosis). Since the spread of PLRV takes more time than PVY, insecticide application can be effective if the aphid populations are closely monitored. Colonizing aphids are the most important vectors for this virus because transmission requires an extended feeding period. The green peach aphid, Myzus persicae, is one of the most important vectors. The use of clean seed is critically important. Roguing of infected plants helps prevent the spread of PLRV and early harvest can help prevent late-season infection. Handling plants will not spread the virus, since PLRV is not mechanically transmissible. Potato virus S (PVS) is of increasing importance in potato. It remained unknown until the 1950's because its symptoms are very inconspicuous. PVS can cause yield loss up to 20%. Seed potatoes are not yet certified for PVS, which contributes to its widespread distribution. 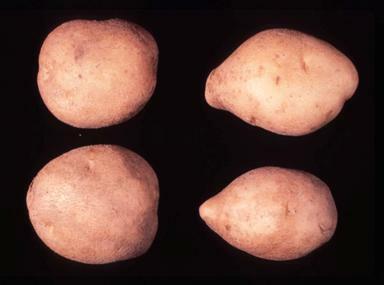 Most potato cultivars are symptomless. On some cultivars, if infected early in the season, will show a slight deepening of the veins, rough leaves, more open growth, mild mottling, bronzing, or tiny necrotic spots on the leaves. PVS is a Carlavirus, and is nonpersistently transmitted by aphids, including Myzus persicae, the green peach aphid. It is also mechanically transmissible, and transmissible through tubers. PVS is very difficult to detect using visual cues. Insecticides are ineffective in controlling nonpersistently transmitted viruses. Crop oils may be used early in the season. Plants tend to be resistant to infection by PVS later in the season. Prevent mechanical spread within the field by sanitizing tools and minimizing movement through the field. Rogue (remove) any symptomatic plants. Potato virus X is the type member of the Potexvirus family of plant viruses. Plants often do not exhibit symptoms, but the virus can cause symptoms of chlorosis, mosaic, decreased leaf size, and necrotic lesions in tubers. PVX can interact with PVY and PVA to cause more severe symptoms and yield loss than either virus alone. The source of this virus is infected tubers. It is transmitted mechanically, not by an insect vector. Tobacco, pepper, and tomato can also serve as hosts of PVX. The most important way to control this virus is to plant certified seed. Spread occurs through the use of tools and machinery. Sanitize all tools, rogue infected plants, and limit within-field movement. Some varieties are more resistant to PVX than others. Varieties with some resistance or tolerance to PVX are HiLite Russet, Atlantic, Norwis, and Sebago (source: http://muextension.missouri.edu/xplor/agguides/hort/g06202.htm). Potato mop top virus (PMTV) is a Pomovirus, and is transmitted by the pathogen (a protozoan with zoospores for infection) which causes powdery scab disease, Spongospora subterranea. PMTV is one of the causes of spraing disease, the other being Tobacco rattle virus (see below). "Spraing" means the tuber has a rust-brown necrosis which occurs in rings or flecks. PMTV occurs more often in heavy, wet soils. Cool temperatures and wet conditions which are favorable for the germination of S. subterranean spores favor spread of the disease. The virus can survive with its vector in the soil for decades. Symptoms of PMTV in foliage and necrosis of tubers. Conditions that favor the spread of powdery scab, cool and wet conditions, also favor the spread of this virus. Viral infection may be reduced in some cases by improving drainage, reducing irrigation, or delaying planting until soils are warmer and drier. Spores infected with virus can survive in the soil for decades. Longer rotations may help reduce the incidence of powdery scab. In the absence of its vector, the virus is rapidly diluted. Tobacco rattle virus (TRV) is a Tobravirus which causes corky ringspot or spraing disease. It occurs more often in coarse sandy soils. 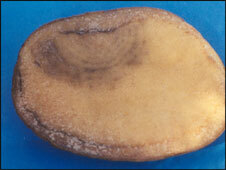 Symptoms often do not appear on the foliage, but the tuber contains corky layers of tissue interspersed with rings of healthy tissue and brown flecks distributed throughout the tuber. This virus is transmitted by 'stubby-root' nematodes in the Paratrichodorus or Trichodorus genus, and can also be transmitted mechanically. 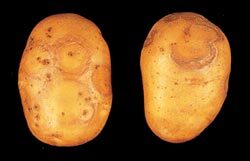 Foliar symptoms of TRV infection and tuber symptoms of corky ringspot disease. The most important control measure is to avoid introducing inoculum into your field by planting certified seed potatoes. The soil should be sampled for the identification of nematodes which can transmit TRV. If the nematode vectors are not present, the virus will not spread. Nematicides are available for use to destroy the vector in the soil. TRV can survive in dormant nematodes for 2 to 4 years. Nematode populations can increase on cereal crops, so rotations should not include them. Several weeds such as shepherd's purse and chickweed are reservoirs, so good weed control can limit viral increase. Limit handling of plant material and sanitize tools and equipment frequently. Plant varieties with partial resistance. Potato spindle tuber viroid (PSTV) is not a virus. It is a viroid, which is essentially a self-replicating RNA, without a protein coat. PSTV is an important disease in breeder stock, where it is often transmitted mechanically, as well as through pollen and true seed. It causes mild foliar symptoms including smaller leaves that curl downward, giving the plant a more upright growth habit. Plants can also be stunted, and leaves can be grey and distorted. The stems are often more branched, with the branches having sharp angles on the stem. Tubers are narrow and spindle or oblong in shape, or more rounded than expected for a particular variety, and have prominent eyebrows (see below). 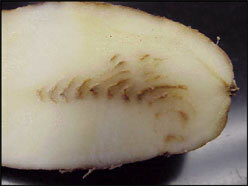 Tubers can also become cracked or develop knobs and swellings. PSTV can also infect tomato and nightshade. The most important control measure for PSTV is to plant certified seed. Various insects have been reported to transmit PSTV, but the most important disseminator is human movement through the field. Sanitize tools and machinery. Rogue infected plants before they can serve as a source of inoculum. Foliar symptoms of PSTV. Note the small leaves and upright growth habit. PSTV causes elongation of tubers (right side). H. David Thurston, Cornell University. Alfalfa mosaic virus (AMV) is a Potyvirus, like PVY. It is nonpersistently transmitted by aphids. AMV causes a distinct calico pattern (yellow blotching) on leaves. Some strains of the virus can cause severe stunting and stem and tuber necrosis. It is not considered an economically important virus. Aphids carry the virus in to potato crops from nearby alfalfa or clover fields. Control of AMV is similar to PVY. Insecticides are not effective. Avoid planting potatoes near alfalfa or clover. 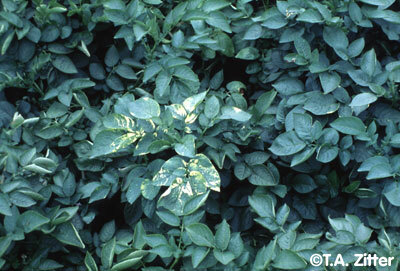 AMV causes a 'calico mosaic,' or yellow blotching of leaves on potato. Buy seed potatoes that have been certified virus-free. Saving potatoes from a field which was infected by virus will increase the number of plants serving as sources of virus in the following season. Remove "volunteer" potatoes in the spring (potato plants coming up from tubers left over from the previous season), as these may be virus reservoirs. Rogue (remove) symptomatic plants  these serve as excellent sources for virus spread within the field. Do not leave rogued plants in the field remove and trash or burn them. Proper composting may be effective to remove potatoes with Potyviruses, Carlaviruses, or Potexviruses, but not those with protozoan or nematode vectors. Rogue weeds which may serve as reservoirs of viruses. Plant early to avoid aphid-transmitted viruses, scout for aphids regularly and apply insecticide (not effective for PVY) or crop oils as appropriate. Avoid planting potatoes next to alfalfa or red clover crops to reduce the risk of AMV. *Please contact before sampling or sending material. Plant varieties which have reported tolerance or resistance to viruses. Sanitize all tools, planters, and cultivators frequently, especially when moving equipment into a new area. Avoid the spread of soil which could harbor the vectors of some potato viruses between fields.